There's just something so seductive about biting into buttery, soft dinner rolls. They are hard to resist, especially when made from scratch, and go with just about anything. So it's worth it to venture into making them yourself. Don't know where to start? To help you out we've put together the ultimate guide on how to make homemade rolls. Before filling your home with the aroma of freshly baked bread, there are a few considerations to keep in mind. First, you'll want to select a recipe that suits your needs. Craving whole wheat dinner rolls? Ones made without eggs? Rolls topped with sesame seeds? 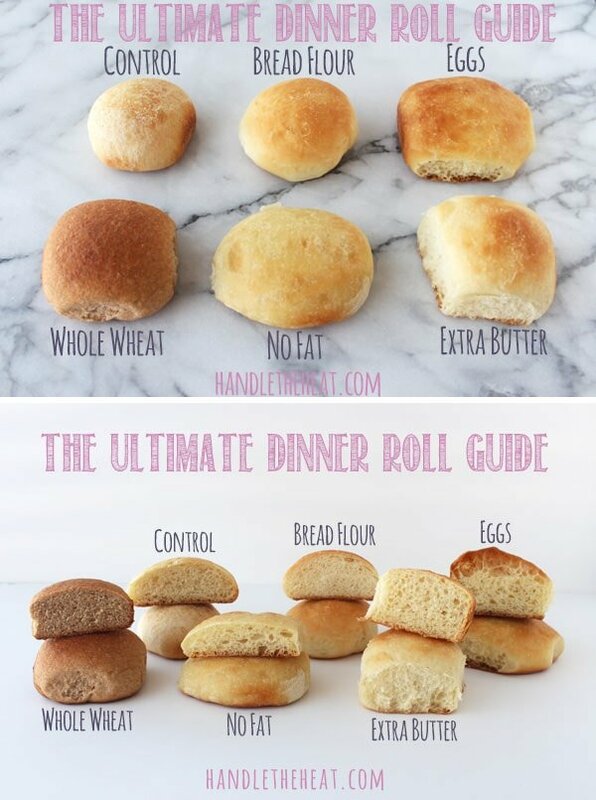 This lovely visual from Handle The Heat illustrates how different ingredients affect dinner rolls. You'll notice those without fat tend to be flat and dense. Butter and eggs are that magical ingredients that contribute to the fluffiness of a homemade roll. Also, baking with bread flour makes a big difference when it comes to texture so keep that in mind when you shop for ingredients. If you are fortunate enough to have a stand mixer go ahead and follow this amazing recipe from Chefsteps. The chefs at the online cooking school breakdown the process of making yeast rolls in a comprehensible way. Their method is easy to understand but, beware, the measures are given in grams. No stand mixer? No worries! You can still make delectable dinner rolls using basic kitchen utensils like a bowl, spoon and plastic wrap. While this video from My Quirky Recipe isn't as technically advanced as the one above, it features great step-by-step instructions for no-fail bread rolls. You won't believe the results! It's best to enjoy dinner rolls when they are still warm after being pulled out of the oven. Top with a pat of homemade butter and you'll be in heaven. If possible, consume the fresh rolls the same day they are baked. If not, pop them in the oven for a few minutes so they become warm and soft before serving. Do you have a special technique for making dinner rolls? Share it in the comments below!